Effects: enhances cognitive performance, regenerates and soothes the skin, aphrodisiac, deodorizes and destroys bacteria. Benefits: The aroma of cedar wood oil enhances new energy flow, cleansing and renewing the aura. It helps to gain more confidence, stabilizes the emotions by keeping one’s feet on the ground; excites and warms up; aphrodisiac; relieves stress, tension, aggression and emotional dependence. 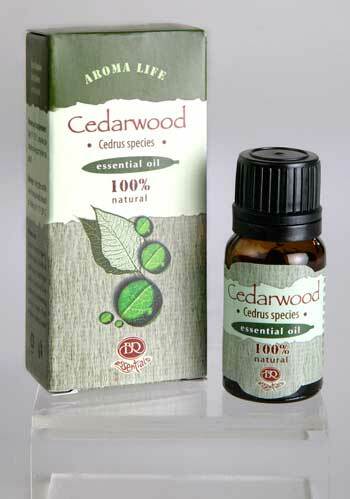 Because of its antiseptic properties the cedar wood essential oil is used in many products for treating respiratory and urinary tract infections, arthritis and rheumatism. It is used in mixtures to treat acne and infected skin, overactive sebaceous glands, dandruff, oily skin and hair, baldness. It relieves itching caused by insect bites. Blends well with other woody aromas, as well as vetiver, patchouli, rosemary and bergamot. Attention: Contraindicated in hypertension and children. Do not use on an empty stomach or during nervous breakdown. Incompatible with alcohol. In high concentration it may irritate and inflame the skin!